Stainless steel takes its name from its ability to resist rusting thanks to the interaction between its alloying components and the environment to which they're exposed. Numerous types of stainless steel serve a variety of purposes and many overlap. All stainless steels are comprised of at least 10 percent chromium. But not all stainless steels are the same. In fact, there are varying degrees of the metal — something many of us don't readily know. Each type of stainless steel is graded, usually in a series. These series classify the different types of stainless from 200 to 600, with many different categories in between. Each comes with different properties and fall into different families including austenitic (non-magnetic), ferritic (magnetic), duplex, and martensitic and precipitation hardening (high strength and good resistance to corrosion) stainless. Here, we explain the difference between two common types found on the market — 304 and 304L. Type 304 is the most widely used austenitic (non-magnetic) stainless steel. It is also known as "18/8" stainless steel because of its composition, which includes 18 percent chromium and 8 percent nickel. Type 304 stainless steel has good forming and welding properties as well as strong corrosion resistance and strength. Type 304 grade stainless steel is also found in sinks, tabletops, coffee pots, refrigerators, stoves, utensils and other cooking appliances. It can withstand corrosion that can be caused by various chemicals found in fruits, meat and milk. Other areas of use include architecture, chemical containers, heat exchangers, mining equipment, as well as marine nuts, bolts and screws. Type 304 is also used in mining and water filtration systems and in the dyeing industry. Type 304L stainless steel is an extra-low carbon version of the 304 steel alloy. The lower carbon content in 304L minimizes deleterious or harmful carbide precipitation as a result of welding. 304L can, therefore, be used "as welded" in severe corrosion environments, and it eliminates the need for annealing. This grade has slightly lower mechanical properties than the standard 304 grade, but is still widely used thanks to its versatility. 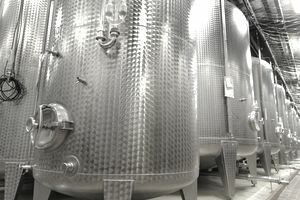 Like Type 304 stainless steel, it's commonly used in beer-brewing and wine-making, but also for purposes beyond the food industry such as in chemical containers, mining and construction. It is ideal for use in metal parts such as nuts and bolts that are exposed to salt water. Carbon 0.08 max. 0.03 max. Manganese 2.00 max. 2.00 max. Phosphorus 0.045 max. 0.045 max. Sulfur 0.03 max. 0.03 max. Silicon 0.75 max. 0.75 max. Nitrogen 0.10 max. 0.10 max. What Is Type 201 Stainless Steel? What Is Chrome-Manganese Stainless Steel? What Are the Different Types of Steel? What Are Monel Alloys? How Are They Used?